The Power of Digital Persuasion. – the ajayi effect. The Power of Digital Persuasion. I can’t lie. When I first heard that ad agency giant, Waggener Edstrom released their new report, “Digital Persuasion: How Social Media Motivates Action and Drives Support for Causes,” I couldn’t help but picture a snake charmer luring one of the forked-tongued creatures out of a basket. It turns out, the study isn’t about that at all. Released by Georgetown University Center for Social Impact Communication and the integrated communications agency Waggener Edstrom Worldwide (WE)’s Social Innovation practice, it found that more than half (55 percent) of digitally active, cause-savvy American adults were likely to do far more than simply “like” a cause. 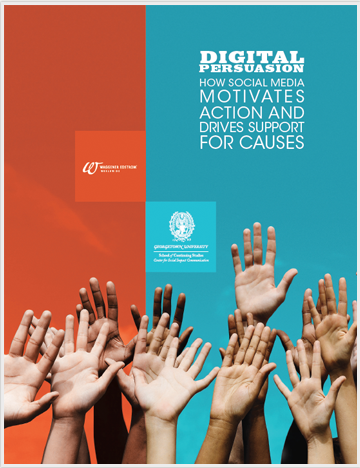 Engaging with causes via social media prompted them to donate money (68 percent), donate personal items or food (52 percent), attend or participate in an event (43 percent), and even volunteer (53 percent). Perhaps signaling a significant departure from previous research, where face-to-face interaction was the primary mode of cause information exchange, survey respondents named social media as their top source of information about the causes they support. This is true even for respondents who only support their chosen causes offline, which further supports this shift. Fifty-four percent of respondents indicate they are more likely to support a cause through social media rather than offline. More than half of survey respondents (55 percent) who engaged with causes via social media have been inspired to take further action. Seventy-six percent agree that it’s important to them to influence others to care about the charities and causes they care about. Eighty-two percent agree that social media is effective in getting more people to talk about causes or issues. The most popular way people get involved in global causes is by supporting on social media (38 percent), followed by mailing a donation (27 percent), and making a donation online or signing an online petition (tied at 25 percent). Further, among survey respondents, four distinct categories of supporters emerged — referred to as Mainstreeters, Minimalists, Moderates and Maximizers. Each group can be extremely beneficial to a cause as long as organizations know how to engage them — and keep them tuned in. Mainstreeters: Active on social media, but only support causes offline. Minimalists: Only support causes online. Moderates: Balance offline support with online actions, such as liking a cause on Facebook. Maximizers: Support an average of 12 different causes — nearly twice as much as any other category — online and off. Looks like I’m a Mainstreeter. Maximizers scare me. GrantWatch Connects the Charity Dots.